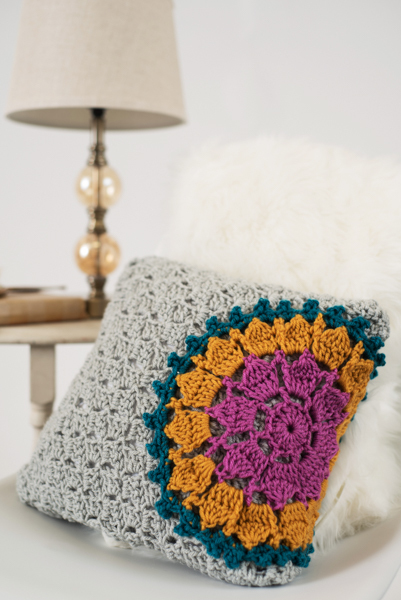 This corner-to-corner crochet project features a mandala that seems to burst from its side of the pillow cover. 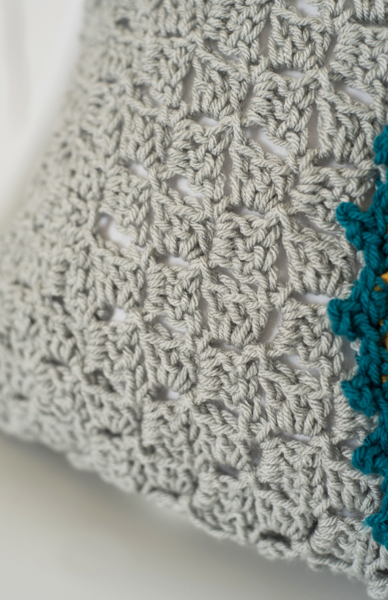 With its added border and sweet handmade touch, this gift will make mom will think of you every time she relaxes on the couch. Both panels are worked from corner to corner stto joyle. The two panels will have a border added, sewn together on one side, the mandala will be sewn over the seam and then the panels will be completely sewn together to finish. Weave in ends as Mandala pattern progresses. Row 1: With A, ch 6,dc in the 4th ch from hook and in next 2 ch (first block made). Row 2: Ch 6, turn, dc in 4th ch from hook and in next 2 ch, (sl st, ch 3, 3 dc) in ch-3 sp of previous row (2 blocks made). Row 3: With B, ch 6, turn, dc in 4th ch from hook and in next 2 ch, [(sl st, ch 3, 3 dc) in next ch-3 sp of previous row] twice (3 blocks made). Row 4: Ch 6, turn, dc in 4th ch from hook and in next 2 ch, [(sl st, ch 3, 3 dc) in next ch-3 sp of previous row] 3 times (4 blocks made). Rows 5-13: Cont in this manner, increasing 1 block on each row until there are 13 blocks on middle row. Row 14: Sl st across first 3 dc, *(sl st, ch 3, 3 dc) in next ch-3 sp of previous row; repeat from * to last ch-3 sp, sl st in last sp, turn, do not make a block in last space (12 blocks). Rep Row 14 until 1 block rem. There are 2 sections around the edge: a ch-3 (or dc edge) and a 3 dc. Row 1: Join A in ch-3 sp in any corner, 2 sc in ch-3 sp, sc in each dc across the 3-dc section. Do not do anything in corners. Just work in each sp, sl st to first st to join. Row 2: Ch 3, *dc in each st to corner (there will be a natural corner created from Row 1), 3 dc in corner; rep from * around, sl st to first st to join. With B, ch 4, sl st to first ch to join. Rnd 1: Ch 2 (does not count as a st here and throughout), work 16 dc in ring, sl st to first st to join. Rnd 2: Ch 5 (counts as dc + ch 2), sk next st, *dc in next st, ch 2; rep from * around, sl st to first st to join. Rnd 3: Sl st in ch-2 sp, ch 3 (counts as first dc), 4 dc in same ch-2 sp, ch 3, *work 5 dc in next ch-2 sp, ch 3; rep from * around, sl st to first st to join. Rnd 4: Ch 2, in ch-sp work 4 dc leaving the last loop of each st on hook, pull through all loops to complete the first cluster, *ch 4, sl st to next ch-sp, ch 4, in next ch-sp work 5 dc leaving the last loop of each st on hook, pull through all loops to complete cluster; rep from * around, ch 4, sl st to ch-sp, ch 4, sl st to the first cluster to join. Rnd 5: Join C in any ch-sp, ch 3 (counts as first dc), work 4 dc in next ch-sp, ch 3, *work 5 dc in next ch-sp, ch 3; rep from * around, sl st to the first st to join. Rnd 7: Join D in any ch-sp, ch 1, [sc, (sc, ch 3, sl st on top of sc), sc] in each ch-sp, sl st to first st to join. 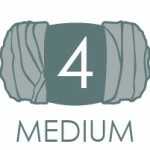 Sew one side together. 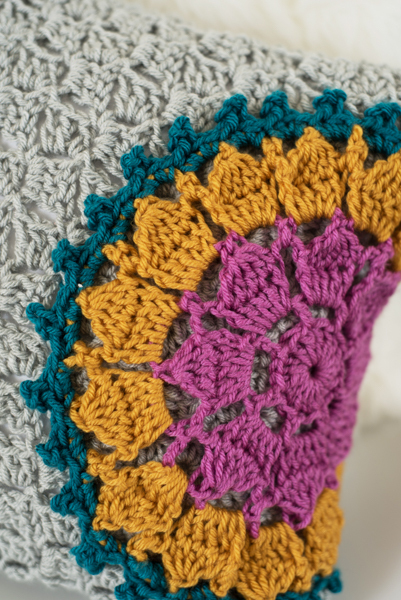 Next, sew the Mandala around the outside edge and in the middle with ¾ of the flower on one panel and over the seam. Could you please email this pattern to me.?? 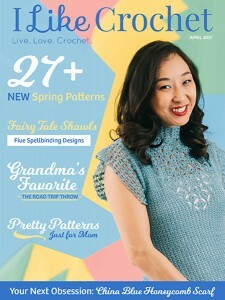 Please email me the pattern. Thanks.